Over the past years, I have been using a lot of different paint arrays with the different results. Below post is a review of different sets produced by various companies. As this is a work in progress I will be including other companies or some specific paints. Think of this post as a start of a longer series that will focus on paint reviews. Let’s start with the fact I will mostly focus on acrylic paints. Acrylic paint is a mixture of pigments (which give the colour) and water (or a another solvent) that is combined with a binding agent (polymer emulsion) which becomes quite resilient as the water eventually evaporates from the paint mix. Take into consideration, that there is a lot of paints on the market, which have different properties (think GW Base, Layer, Glaze) and consistency, some will have less pigment, or more biding agent. Some, like Warcolours have a very different mix and are gel based. Please be also aware, that some paints will be better for different things and for different styles, I will try to include different approaches and requirements. Honestly you will need to find what is best for you. One more thing – I paint over white surfaces – which have a huge impact on the saturation and intensity of the colour. So, what is important for me? Let’s start with the current line of Games Workshop – as this are well known and best to compare too. GW produces now several different paint types, they divided them into 5 main groups: base, layer, glaze, shade and air. 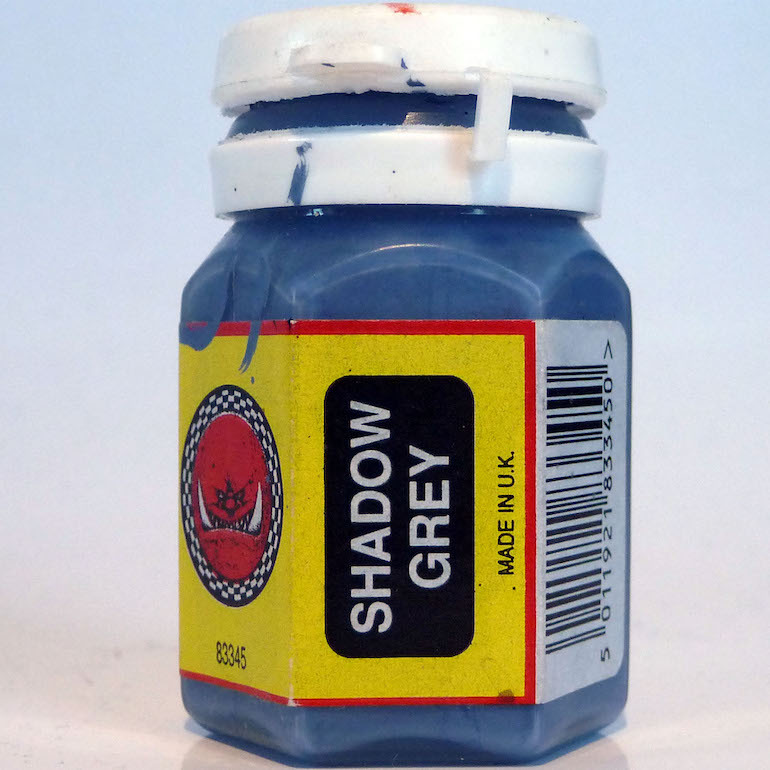 There are also specialist paints for texture and effects. But this will not be discussed here. Well those aren’t bad. The biggest issue I have with them is that the colours in this range are bland and not very vibrant. There is one awesome and great paint in this range: Retributor Armor. The best metallic gold in acrylic range from all companies. Layers: aim for easier working with highlights / shades. Less pigment, less binding agent a bit more solvent. Probably the crappiest things I used to work with. Difficult to cover surfaces, not vibrant and in general not worth the money. Glazes: very small amount of pigment, lots of solvent. Well, they work. Not the best quality for the money you pay, but the idea was nice. Air: to a paint similar to layer paints, they add a lot thinner (it includes flow of the paint) as well as retarder (check the article about thinning your paints if you want to know a bit more details about those). Shades: old washes. Funny thing is that those are probably the best in the market. Buy two pots of Lahmian medium and use a different brush to add it to the paint, to make sure it remains clear. Washes should never be diluted with water, as adding it to the mix, will create surface tensions. This is exactly what should not be happening, as when surface tension occurs the paint will not flow properly. Use Lahmian Medium. 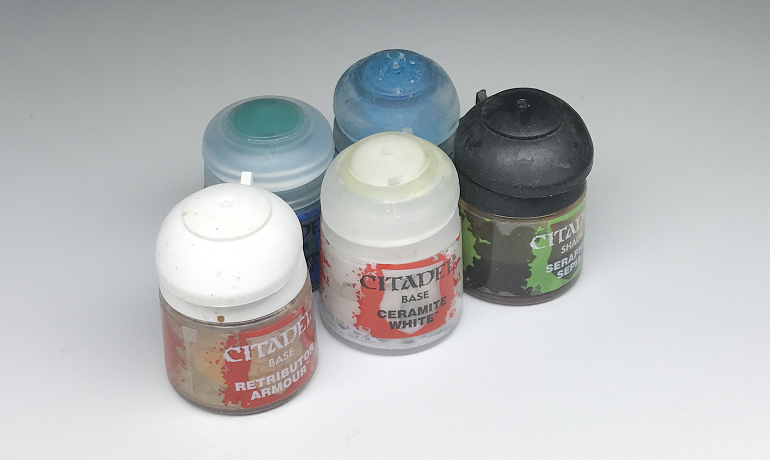 One last thing about GW range – it doesn’t contain inks. Inks are pretty unique – they have TONS of fine pigment, TONS of solvent, and are quite difficult to work with, but can produce awesome effects. Check Bohun’s work, he is mostly using inks. As most of further reviews, will be done in comparison to this, my score for them 2,5 / 5 (with 5 being the best). Most of you will be thinking about the paints in hexagon pots. 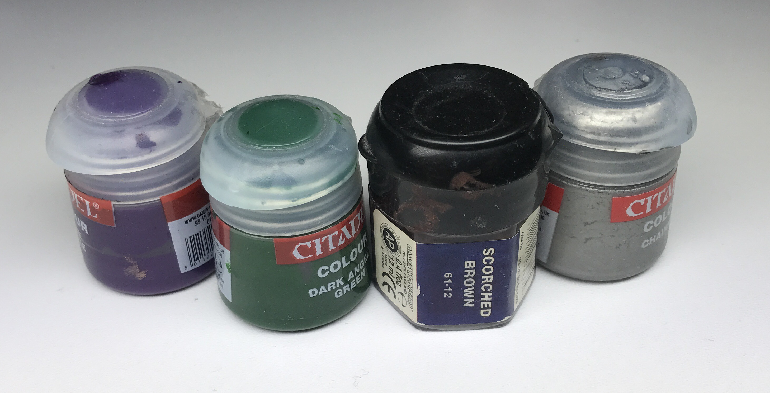 Funny thing is, that those were also produced in pots identical to current GW paints – to tell if you have those older, better paints check the logo on – if it is done on red background, then that’s the good one! Paints like Enchanted Blue, Snakebite Leather or Golden Yellow will have a warm spot in my heart. Great quality of pigment, great colours and even better usage. Glazing was so smooth. I am still looking for those things on sites like Ebay, as I miss them. I have like 3 pots of my favourite skin tone – Bronzed Flesh that I bought to make sure I will be able to keep using this paint. Sadly, I am slowly coming to an end of my lost pot of true snakebite leather and there is no enchanted blue one the horizon. I know people who almost wept over blood red. If you have those cherish them. One more thing to remember – there was a line with them called foundation. It contained insane amounts of fine pigment, which immensly helped in paitning base layers of paint. Before, in my opinion, the best line (hexagon paints mentioned above), there was a line GW produced that was sold in tall pots. Those weren’t very handy, but for a lot players – were the first things they started working with. Those are actually still produced, with a different brand – but with almost the same mixture : ) They are called Coat d’Arms and have some very nice colours.